Sip on some Peroni-infused cocktails while admiring the work of eight up-and-coming designers at The House of Peroni this month. Expect a range of expertly-concocted drinks inspired by each of the designers as well as the chance to wander through eight immersive, uniquely-designed areas. The designers showcased their collections during London Fashion Week so you’re definitely in for a treat on the eyes. You’ll also find some authentic, Italian food and the chance to take part in a cocktail masterclass where you can put a twist on your own Peroni-infused cocktail. It’s impossible to wander through Covent Garden without gazing up at the Royal Opera House. And, really, is there any classier way to spend the evening than by being serenaded by some of the best names in the business? You’ll find world-renowned shows, a lively atmosphere and beautiful architecture. 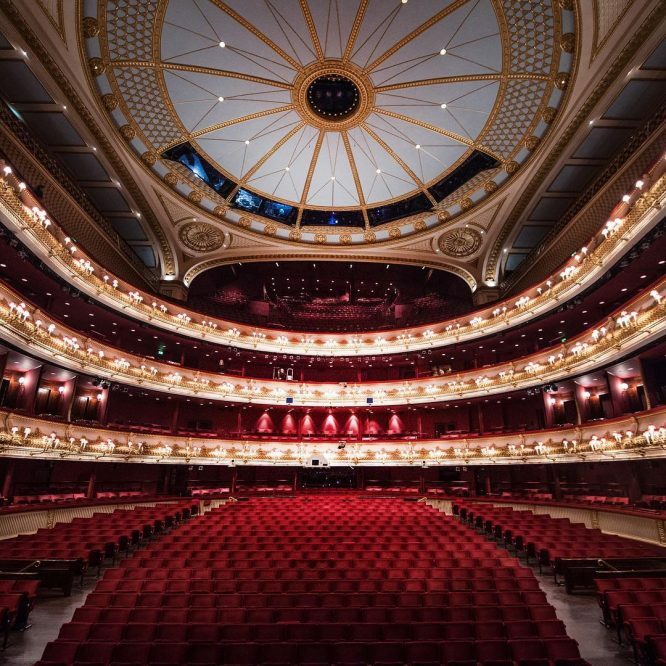 Not only can you watch some opera or ballet at the ROH, but you can also check out the restaurant, cafe, shop and rooftop terrace for a fully-planned evening in London’s cultural capital. If you find yourself in the area on a Sunday afternoon and without a ticket, you can still visit the building for some free music and activities. We’re never too old for magic, especially when the setting is a fancy Covent Garden hotel. Sit back at Simpsons on The Strand (part of The Savoy group) with a drink in hand and watch two of London’s finest magicians wow you with their tricks. Tony Middleton, a finalist in The Magic Circle Stage Magician of the Year 2018, and Dominick Zwolinski, with more than 20 years experience, will spook you with everything from mindreading to illusion and traditional tricks. The show lasts for an hour and 15 minutes and is almost guaranteed to puzzle you. It’s definitely a different way to spend your Saturday evening and will probably keep you second guessing the tricks for a while. This Turkish restaurant encapsulates everything we know and love about the theatre and isn’t afraid to hold back with its decor choices. Inside, you’ll find props of all ages from productions over the years while outside there’s a floral doorway to complete the look. Go for a pre-theatre menu (the Tenor menu) for a slightly cheaper meal out and ask for a balcony booth to get the best seats in the house. Turn up later in the day to eat your meal to the sounds of a live singer or band. But if there’s one thing you have to do when you visit Sarastro, it’s take a visit to the X-rated toilets. Filled with some very non-PG paintings, it’s probably one of the few places in London where they can pull the pictures off as vaguely classy rather that downright offensive. At the heart of Petersham Nurseries lies Floral Court. Slightly tucked away from the rest of the hustle and bustle of Covent Garden, it comes alive when the sun comes out, when nearby restaurants set up outside tables. This courtyard is surrounded by bright white walls and plenty of foliage, making it a perfect spot to spend an early evening, particularly if you’ve had a busy afternoon wandering around the rest of the city. As well as an area to relax, you’ll find a florist, a delicatessen, a cellar and a shop. Set yourself up with a glass of wine and some Italian small plates (known here as ‘cicchetti’) and watch the sun go down. This Comedy Carnival takes place at the prestigious Seven Dials Club each Friday and Saturday throughout the month. Featuring some of the UK’s biggest acts, the evening includes everything from a restaurant dinner to a night of laughter and free entry to a club for some more drinks afterwards. Choose from either a fancy pizza or Mexican/Peruvian small plates with a drink and sit back and prepare to laugh. You’ll find yourself surrounded by red velvet curtains, flashing lights, and a lengthy enough wine menu to keep you satisfied the whole evening. If you’re a fan of the theatre but don’t want to splash out huge amounts of money for the tickets, the Comedy Carnival is a great alternative option.